There is a reason the Amanita phalloides mushroom is called the "Death Cap." It can kill you. Mushrooms are a type of fungi, an organism that produces thread-like mycelia that often produce spores. Spores allow the fungi to reproduce. Molds, lichens, and yeast are all fungi, but the most visible fungi are mushrooms. Some fungi are delicious, but others can cause disease or, and still others, like Penicillium, can cure it. Mushrooms as a food crop show up in regular and gourmet dishes. Among the expensive edible fungi of the world are wild Chanterelle mushroom and truffles. While small button mushrooms are available at your local grocery store, the wilder, more gourmet varieties are usually not. One of the mysteries of wild mushrooms is their location. You can find them on private and public lands around the world. These mushrooms belong to those who hunt them, and good mushroom hunters often keep the location of valuable varieties secret. Because fancy mushrooms have gourmet buzz and can earn a pretty price, amateur mushroom hunters sometimes go looking for them — and end up the worse for it. Mushrooms also take down people looking for healthy foods, who forget some of the deadliest poisons in the world are 100% organic and "natural." Poisonous mushrooms — and plants — pop up all over. While there are specialists who can identify poisonous plants and deadly mushrooms, most people can't, and when they eat them, can get very sick or even die. Recently, the Centers for Disease Control and Prevention (CDC) reported on a mushroom season that led to severe illness for more than 14 people. In late November 2016, members of the Bay Area Mycological Society in San Francisco reported an unusually large bloom of A. phalloides to the California Poison Control System (CPCS). Common symptoms of toxic mushrooms include nausea, abdominal cramping, diarrhea, hallucinations, and dehydration. The primary poisons in mushrooms are alkaloids, which interrupt cell function and protein synthesis and can destroy kidney, and liver, function, among other damage. In only five days, the CPCS was notified of the first A. phalloides poisoning event of the season. A 37-year-old man picked two mushrooms in Santa Rosa. After cooking and eating one, the man developed severe gastrointestinal symptoms and went to an emergency department where a mycologist (a mushroom specialist) was able to identify the mushroom he ate was A. phalloides. Given aggressive medical support, the man recovered and was discharged from the hospital six days later. Within two weeks, a family, along with family friends, was poisoned by A. phalloides after a 26-year old mom received mushrooms picked by a stranger earlier in the day in the California mountains. The woman grilled and served the mushrooms to her husband, 18-month old daughter, sister, and a family friend. After suffering severe symptoms, doctors at the local hospital treated the family about nine hours after the meal. Doctors released the parents after six days of treatment, but the baby suffered liver failure and received a liver transplant. The process and the poison left the baby girl with permanent neurological impairment. The sister also suffered organ failure and received a liver transplant. The family friend survived without a transplant. Later in the same season, eight more cases were reported of severe liver damage after ingestion of A. phalloides in Northern California. One of the victims required a liver transplant, while the other victims survived. These cases offer frightening evidence of the danger lurking in a seemingly innocuous mushroom cap. What does a poisonous mushroom look like? There is no typical-looking "dangerous" mushroom. The mushroom pictured above is a A. phalloides. Mushrooms make their living on decaying organic material, often forming close relationships with forest hosts like coniferous, or hardwood trees. Amanita mushrooms are only one of several types of poisonous mushrooms — but they cause the most injury and death. Poisonous mushrooms often have no striking features and can be attractive. While there are types of Amanita mushrooms that are not poisonous — picking and eating them is not worth the risk. Foraging for, and eating, any plant or fungi material that you cannot accurately identify is dangerous. Unfortunately, many people believe mushrooms are safe to eat after cooking. The poisonous component of Amanita mushrooms is called amatoxin, and it is always toxic, no matter how you prepare it. Amanita pantherina, or Panther Cap, is mostly found in the northwestern US and is potentially fatal. 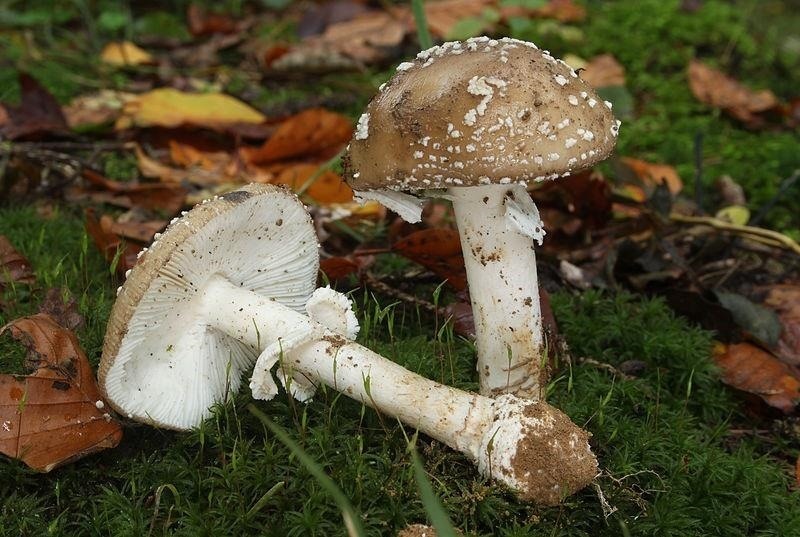 Some of these pop up in lawns around woody areas, putting children at significant risk of eating mushroom parts. 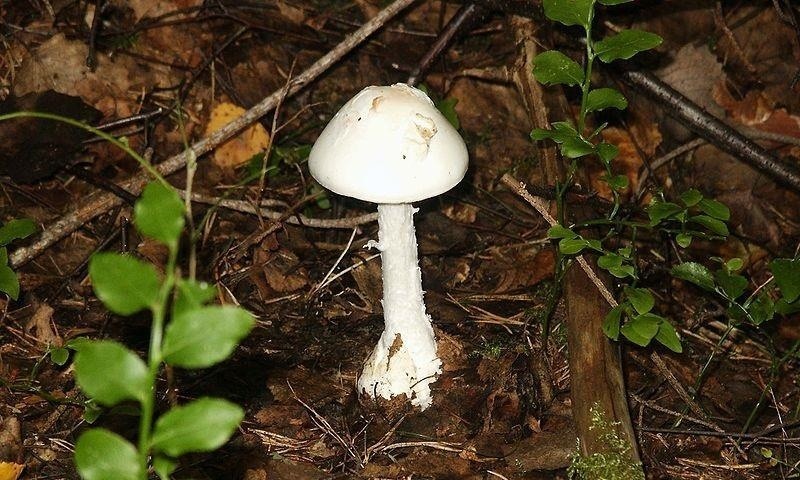 Amanita virosa, or Destroying Angel, is located throughout North America in woody locations. Lovely mushrooms, but as dangerous as Amanita phalloides, this mushroom causes symptoms within six hours, and death within ten days. Galerina autumnalis, or Autumn Galerina, is an attractive mushroom often found on or around decaying wood. This genus includes several seriously toxic mushrooms, some that are found in the Pacific Northwest, while others are found throughout the US in woody areas and sometimes lawns. These mushrooms can be mistaken for "magic" hallucinogenic mushrooms. Symptoms occur within six to 12 hours, with coma and death within seven to 10 days if treatment is not effective. The call of a delicious novelty food lures mushroom hunters into the woods and hills. The bottom line rule for picking and eating wild mushrooms is ... don't, unless you are a mycologist, though even experts sometimes make mistakes. Unlike Poison Ivy, there are no identifying ditties to help you avoid every poisonous mushroom. Do not eat anything you are not absolutely sure is not going to harm you and your internal organs. If convinced your wild mushroom is edible, eat only a small portion (without mixing with different types of mushrooms), do not wash it down with an alcoholic beverage. If you have no symptoms, try a small quantity a few days later, but don't consume massive quantities of wild mushrooms at any time. Avoid mushrooms with rings on the stem, white gills (on the underside of the cap), and any shroom that resembles an Amanita species. Avoid pink, purple-brown, or black-gilled mushrooms, as well as any mushrooms with red or orange flesh, or flesh that quickly turns blue after being sliced. When cooking with wild mushrooms, keep an uncooked sample of an entire mushroom. If symptoms occur, take the mushroom with you to the emergency department. There are 55 Poison Control Centers in the US that provide confidential, free, expert medical advice 24/7. Wild mushrooms can be delicious or deadly. The CDC estimates about one in six Americans is hospitalized each year of foodborne diseases — that includes mushroom poisoning. Altogether, about 3,000 die from pathogens or toxins in food. Symptoms of food and mushroom poisoning are similar — if you ate a mushroom you could not identify, take yourself, and your mushroom, to the emergency room for help.